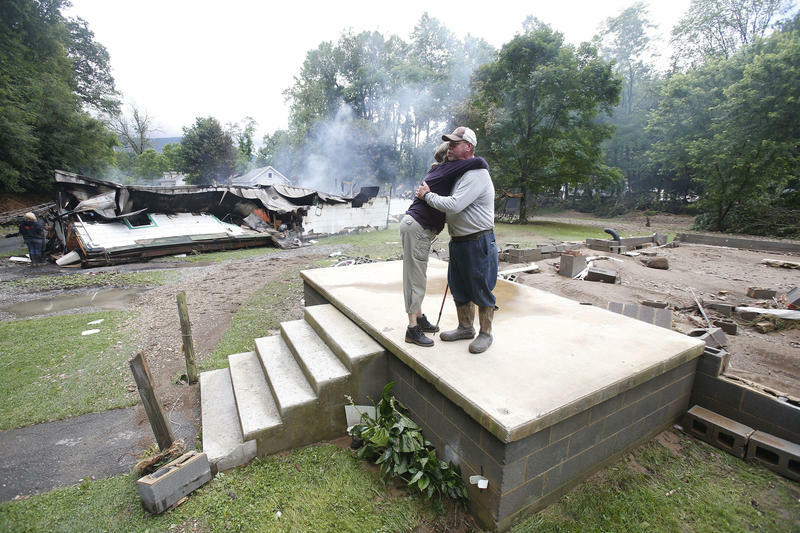 In this June 24, 2016 file photo, Jimmy Scott gets a hug from Anna May Watson, left, as they clean up from severe flooding in White Sulphur Springs, W.Va.
Two more officials involved in an embattled housing program aimed at helping West Virginia flood victims are out of their jobs. Mary Jo Thompson and Russell Tarry of the West Virginia Development Office were scheduled to speak Tuesday at an interim legislative committee meeting on the deadly 2016 floods but lawmakers were told they resigned on Friday. Tarry was the office's deputy director and Thompson was director of community advancement and development. Gov. Jim Justice forced out state Commerce Secretary Woody Thrasher earlier this month and Deputy Commerce Secretary Josh Jarrell was fired after complaints about poor management and residents receiving no help from RISE West Virginia, a $150 million housing assistance program. The Commerce Department was put in charge of the program in 2016 by then-Gov. Earl Ray Tomblin.